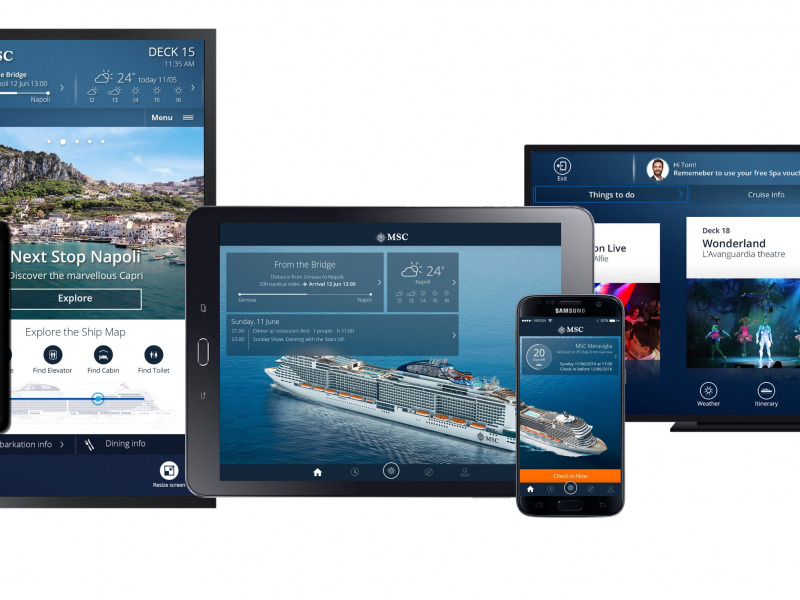 Geneva, Switzerland, 08 March 2017 – Today at leading travel show ITB Berlin, MSC Cruises, the world’s largest privately-owned cruise line, has unveiled its fleet-wide digital innovation programme, MSC for Me. 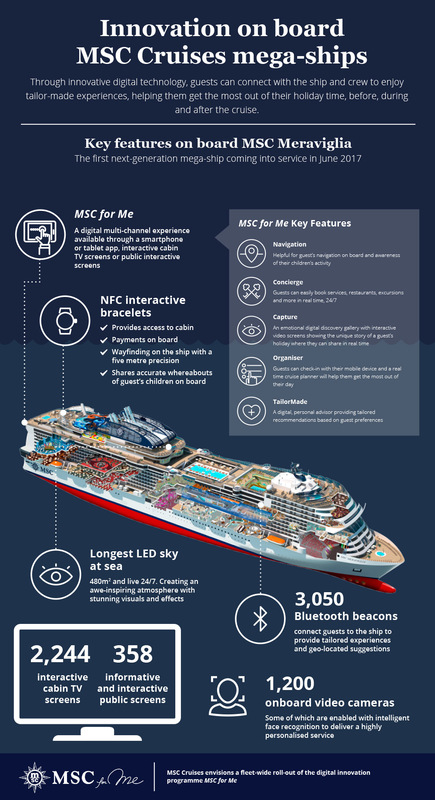 After spending the past three years working with over eleven of the world’s leading digital, tech and behavioural science experts, among which Deloitte Digital, Hewlett Packard Enterprise and Samsung , MSC Cruises’ holistic programme puts guests at the heart of every step of the development, design and construction of its ships. The Company envisions a fleet-wide roll-out of the programme, to the 11 upcoming next-generation mega ships – to be built under its industry-unprecedented €9 billion, ten-year investment plan – as well as to its 12 existing ships. 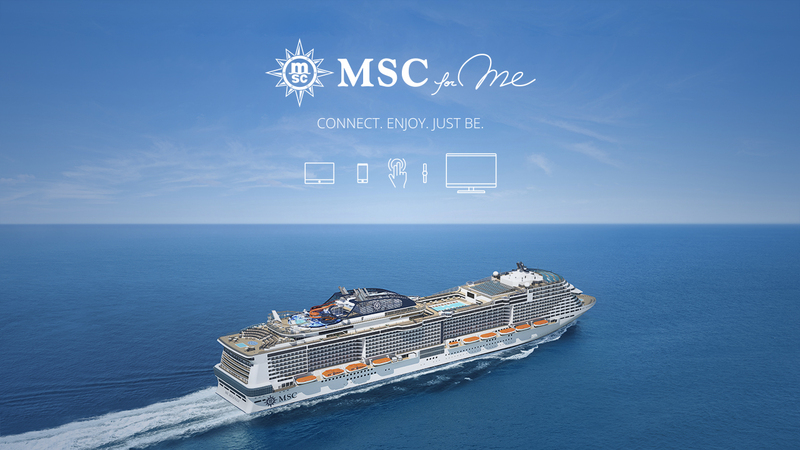 MSC for Me will bring to the sea some of the very latest advances in customer-centric technology, in a programme designed to meet the needs of guests for years to come. 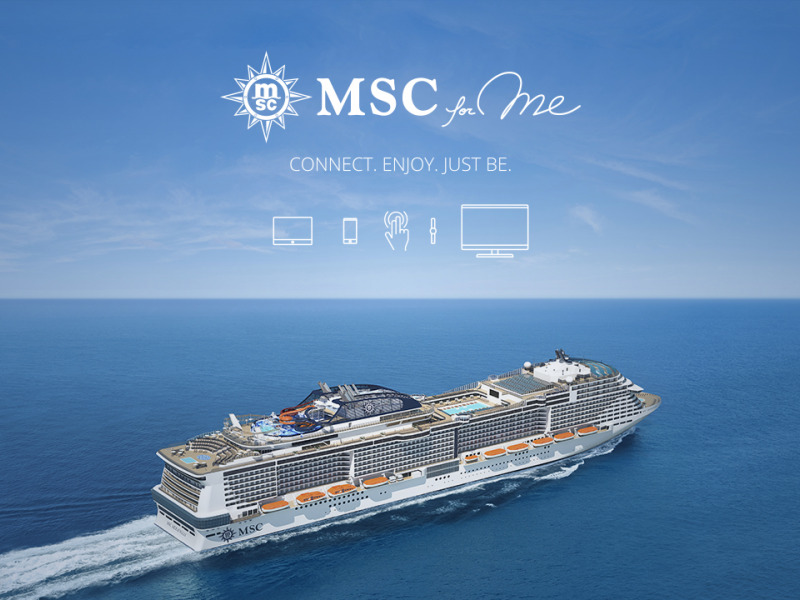 It will debut on MSC Meraviglia, the Company’s first next-generation new mega-ship coming into service this June, which will be fitted with 16,000 points of connectivity, 700 digital access points, 358 informative and interactive screens, and 2,244 cabins with RFID/NFC access technology. The programme will next be rolled out on MSC Seaside in November. MSC Cruises’ Business Innovation team, supporting the vision and leadership of the Company’s Executive Chairman Pierfrancesco Vago, has overseen the integrated development, design and construction of the new ships. There will be three new classes of ships built from three new prototypes under the Company’s ten-year investment plan. As a result, MSC Cruises will ensure that state-of-the-art technology is fully incorporated into every step of the development process of each prototype, from conception and construction through to the coming into service of each individual ship. Mr Vago added: “The length and scale of our investment plan is unprecedented in the industry and it means that we aren’t just planning ships and experiences relevant to our cruise guests in the next few years, but to those we will welcome on board as far out as 2030 and beyond. Technology at the service of the guest experience is advancing at a rapid pace and that is why we’ve already invested €20 million in the first two ships alone, to develop technology and infrastructure that is capable of meeting the needs of guests for years to come. Technology must enable our crew in providing an even better service to our guests, and ultimately must enrich human contact. With 170 different nationalities sailing with us, the challenge for communicating effectively with guests is complex. There is a need to provide relevant information based on the guest profile, and the digital channels must facilitate the effective delivery of this information. To simplify and optimise planning before and during the cruise to help guests better understand all of the offerings available, leaving more time to enjoy their holiday. To enhance the experience beyond ‘the life on board’ by integrating the guest experience before and after the cruise as part of a complete customer journey. Additionally, research showed that more than one in two guests are increasingly looking at customising their holiday experience both before and during their cruise (59%), with one out of six guests (17%) claiming to do so only once they’re on-board. Furthermore, nearly three quarters (73%) of guests claimed to be interested in a holiday at sea on a more connected ship. The research also identified that more than two out of three guests (69%) wish to use a smartphone on board, and more than one in three (36%) uses a tablet whilst at sea. + Navigation: this digital way finder will provide guests on board with advice, guidance and information on what’s on. The technology is similar to smart maps and helps them find their way on the 300+ metre long ships with a 5 metre precision. It also allows guests to locate their children, as needed. + Concierge: allows guests to easily book services, restaurants, excursions and more in real time, 24/7. + Capture: digital immersive discovery through virtual reality to preview excursions and a gallery with interactive screens showing the unique story of a guest’s trip, which they can share in real time. + Organiser: a planning tool for guests to check in with their mobile device, book trips, seats for shows, or the best dinner table, before embarking or when on board. + TailorMade: this digital, personal advisor will provide tailored recommendations, based on preferences. Intelligent face recognition will help staff take care of guests in a highly personalised way. 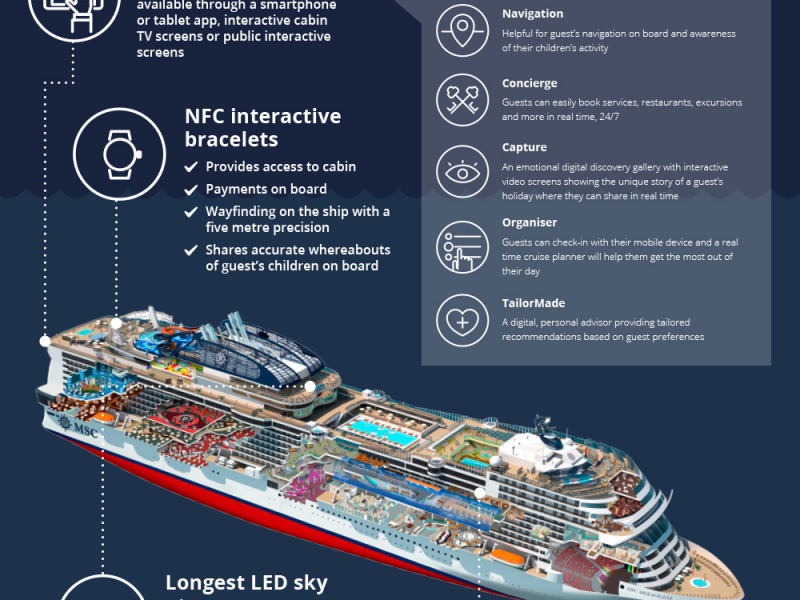 Interactive bracelets will connect guests’ to the ship’s services and will activate geo-located suggestions through 3,050 Bluetooth beacons. Overall, MSC for Me will provide guests with over 130 smart features geared toward a fully optimized holiday experience. These include a dedicated app to help guests tailor their holidays at any point on their journey, whether they are booking their excursions prior to embarkation or a specialty restaurant whilst relaxing by the top-deck pool. This will improve the overall guest experience, while also freeing up more time to enjoy one’s holiday at sea. In 2016, MSC Cruises welcomed on board its ships 1.8 million guests from 170 countries. By 2026, the Company expects to welcome over 5 million guests a year. As market leader in Europe, South America and South Africa, this year marks a milestone for MSC Cruises as the Company will celebrate the christening of MSC Meraviglia in Le Havre on 03 June and MSC Seaside in Miami on 21 December. Two more ships, MSC Seaview and MSC Bellissima are currently under construction and will come into service in June 2018 and March 2019, respectively. 1 Partners also include Accenture, Kodak, Bell, and Bosch, among others. 3 Research carried out online by Deloitte Digital. A representative global sample of past MSC Cruises guests participated in the survey in 2016. 4 This technology is designed in line with the most stringent privacy laws, and will also offer increased security at sea.